In this article, Findmypast military expert Paul Nixon explains how to unpack a Royal Navy Service record, and demonstrates how this can be the key to unlocking further information about your ancestor. Most of us, when researching our family history, come across at least one ancestor who served in the army or navy. The records which detail their service can offer a wealth of information, but because of the professional, specialised nature of the collections, and the way information is noted, they can prove tricky to decipher for anyone not already familiar with them. Running away to sea sounds like a romantic fantasy nowadays, but since the early 16th century, Her Majesty's Naval Service has been a means for adventure-seeking boys and men to see the world in a way which would otherwise have been impossible. Unlike British Army service records, Royal Navy records normally only run to one page , and sometimes no more than half a page. The record began when a man signed up and would be annotated throughout his naval career. Boys as young as 15 could join the Navy, meaning they could serve their country several years before the army would allow them to. 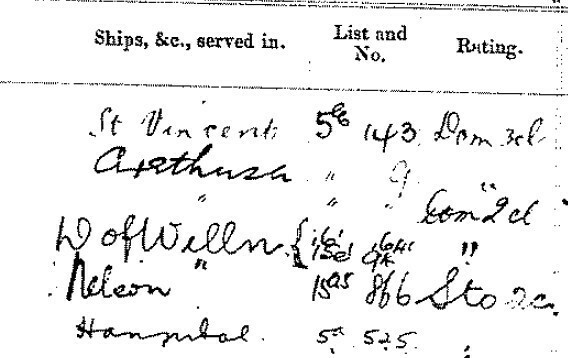 In the example which follows, I look at the naval record for a man I researched many years ago when I was studying the community of Chailey in Sussex and its contribution to the Great War. Montague John Gates was born on the 16th November 1882 and was the son of William and Sarah Gates of Chailey Green. He joined the Royal Navy on the 6th September 1898, giving his date of birth as 1st September 1880, his place of birth as Lewes, and his occupation as page boy. All of this information is written across the top of his naval record which is stamped with his Royal Navy number: 356819. Montague would ultimately serve until 1921, thus qualifying for a pension as well as the Naval Long Service and Good Conduct medal. You can read more about his lengthy service on my Chailey blog, but for now I want to pick out some points of note on his service record. I have often thought that it would be fun to compile an inventory of servicemen's tattoos. When a man joined any of the three services, distinguishing features were to be noted. The reason for this was that it would help identification of the individual if he were to subsequently desert or "run" to use the naval term. Montague had a good collection of tattoos: a "Japanese lady, snake and peacock on right arm, necklace of leaves around neck, flowers and face in leaf on left arm". We also see his height, hair colour, eye colour and complexion. These descriptions were completed on three occasions: when he joined up, when he elected to complete 12 years and when he extended to complete 21 years. This explains why his height increased from five feet five inches in 1898 to five feet six and a half inches by May 1903. The "List and No." column refers to the pay list of the ship's ledger on each ship that he served on, and his ship's book number. "Rating" is a naval term which would read "Rank" had Montague joined the army. Over his 21 years' service he had a varied career, starting as a Domestic 3rd Class, progressing through to the hard and dirty work of a Stoker 1st Class, and ultimately ending his naval service as a Chief Petty Officer (CPO) Telegraphist. This National Archives' webpage gives more information on common abbreviations to be found on medal cards (and service records). Look across to the columns on the right hand side of the document to see when Montague served on each of the ships or shore establishments. Nelson, Victory I and Victory II are all shore establishments based at Portsmouth, but he was certainly involved in the Battle of Jutland, serving aboard HMS Iron Duke which was the flagship of the Grand Fleet commanded by Admiral Sir John Jellicoe. These right hand columns also note a man's character and ability. Montague's character was consistently noted as VG (Very Good) and his ability noted as "Supr" (Superior). The "RMG notation is a recommendation and means that he was to be Recommended for the Long Service and Good Conduct Medal with Gratuity. In many respects, a naval service record can act as a springboard for further research. There is plenty of scope on Montague's record to find out further information about the ships on which he served, as well as the typical duties he would have performed in his varied and wide-ranging roles. Montague Gates was discharged from the Royal Navy in March 1921, but by the time the 1939 Register was taken, was living at 18 Tennyson Road, Portsmouth with his wife Alice and working as an assistant at the Admiralty and Technical Pool, HM Signal School. His death was registered at Portsmouth eleven years later in the second quarter of 1950. Extracts from Montague Gates's service record (ADM 188/540) are Crown Copyright and are reproduced with the kind permission of The National Archives. The inclusion of pensions in the records means that you can find not only details of the seaman's service, but also their pension claim and pension awarded, which itself can prove illuminating. Pensions were originally paid out of the Chatham Chest, which was a fund set up around 1590 for the sole purpose of paying pensions to disabled seamen. Contributions were deducted from members' paychecks (sixpence per month) to finance the fund.